Learning Italian language in a wonderful town placed near the seaside, Viareggio. Spending a different learning holiday with several Italian language courses conceived for foreign students, from March to October. Viareggio is a chic seaside resort placed on the Versilia coast, an area rich of nature and vegetation which can offer stillness and quiet, and full of energy and enthusiasm with the presence of several services, pubs, cafes, restaurants, discos, cinemas and shops in order to give visitors any kind of entertainment and fun. So…sun, sea and fun….what’s better? The Italian language school “Centro Culturale Giacomo Puccini” organizes several Italian language courses dedicated to foreign students from March to October, conceived in order to meet all different needs of students. More details about the Italian language school in Viareggio. The Italian language school "Centro Culturale Giacomo Puccini" organizes several Italian language courses dedicated to foreign students from March to October, conceived in order to meet all different needs of students. More details about Italian language courses in Viareggio. Would you like to learn Italian language in a seaside resort rich of events and entertainment? 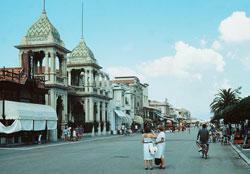 Choose Viareggio and Centro Culturale Giacomo Puccini! Our school offers leisure activities as well. 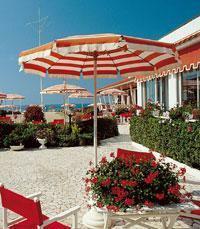 See an example of organised activities in Viareggio. Discover Viareggio, one of the most famous beach destination in Italy. The wide, endless beaches, the excellent cuisine and the exciting night-life with its well-known "Versilian" discos -all contribute to make Viareggio a favorite holiday resort. If you want to enroll to Centro Giacomo Puccini, Italian language school in Viareggio, please click here! Read more about Viareggio and Versilia, the Tuscan coast famous to be popolar for Italian and international vips. Visit AboutVersilia.com travel guide, where you will find many useful information to plan your travel to Tuscan seaside.